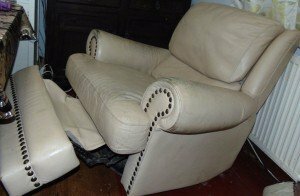 A retro reclining gentleman’s armchair, upholstered in cream faux leather with studded detailing. 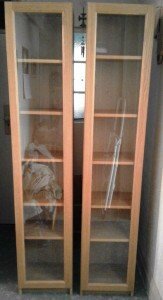 A pair of tall standing wood bookshelves inlaid with glass, each having five shelves to the inside. 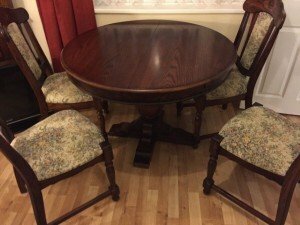 A vintage mahogany circular extendable dining table, together with four matching dining chairs, upholstered to the seats and back rest in floral patterned fabric. 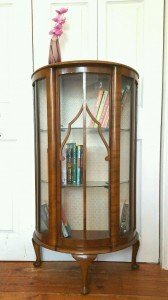 A vintage 1930’s walnut rounded display cabinet on paw feet, having glass inlaid doors opening to reveal two glass shelves. 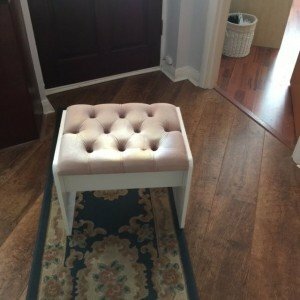 A small solid wood hand painted white dressing table stool, upholstered to the top in pale pink velour with button detailing. 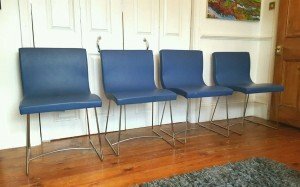 A set of four retro curved dining chairs on chrome legs, upholstered in blue leather. 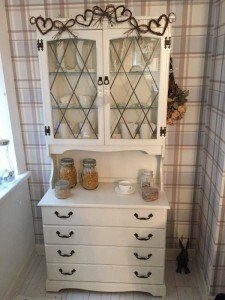 A tall standing kitchen dresser in the shabby chic style, the bench top with a double door cupboard to the top and four drawers underneath. 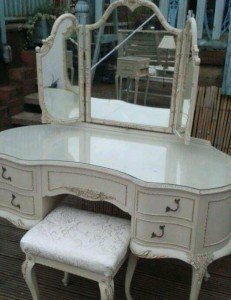 A solid wood hand painted vanity table in the French style, together with an ornate gilt tri folding vanity mirror. 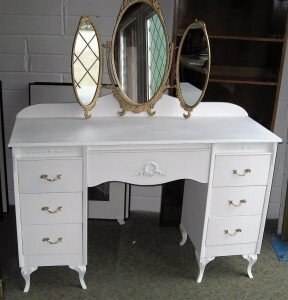 A white solid wood vintage dressing table and mirror, together with a matching stool. 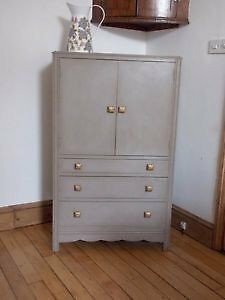 A solid wood tall boy dresser hand painted in grey, having a double cupboard above three drawers. 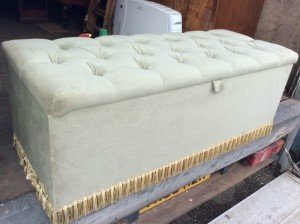 A large vintage ottoman upholstered in cream velour, with button detailing to the top and gold tasseling to the bottom. 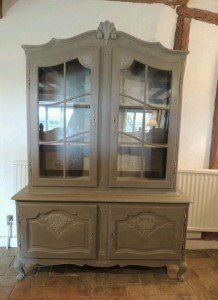 A large hand painted grey solid wood dresser in the shabby chic style, having two glass inlaid doors opening to reveal two shelves, above two small cupboards. 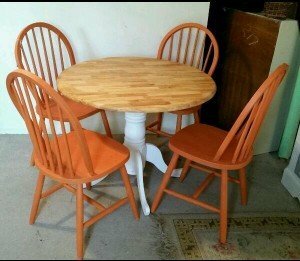 A large solid wood circular dining table, together with four rounded back dining chairs, hand painted in orange. 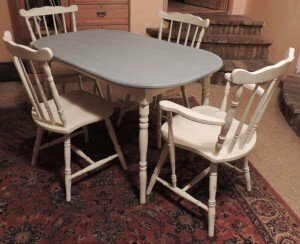 A large rounded top hand painted grey and white dining table, together with four matching low back dining chairs. 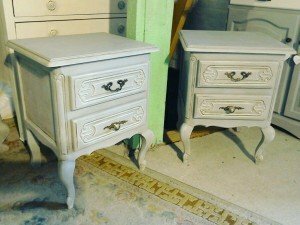 A pair of solid wood carved two drawer bedside tables, hand painted in grey with cast iron handles. 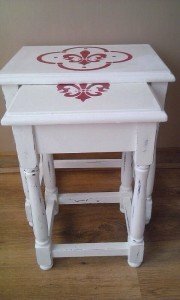 A nest of two solid wood side tables, hand painted in white with red patterned murals to the top. 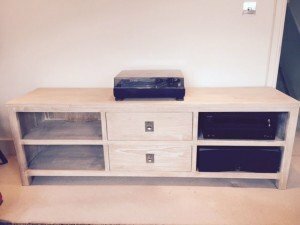 A large solid wood television unit, having two shelves to either side of two central drawers. 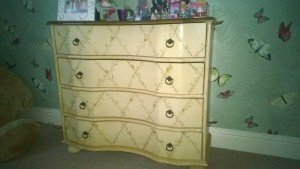 A large vintage solid wood chest of four drawers on ball feet, decorated with a floral garland pattern. 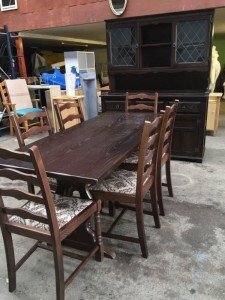 A large rectangular dark wood dining table, together with six matching dining chairs, upholstered to the seats in floral patterned fabric. 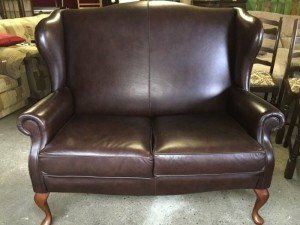 A two seater high back Chesterfield sofa on mahogany legs, upholstered in authentic chocolate brown leather.